Chris Gayle has accused the West Indies Cricket Board of victimisation after Dwayne Bravo and Kieron Pollard were omitted from the World Cup squad. Bravo and Pollard were seen as leading the player revolt, following a pay dispute with the WICB, that led to the abandonment of October's tour of India. "There's no way you can tell me those guys shouldn't be in the team," opening batsman Gayle insisted. "For me, it's got to be victimisation towards those two guys." 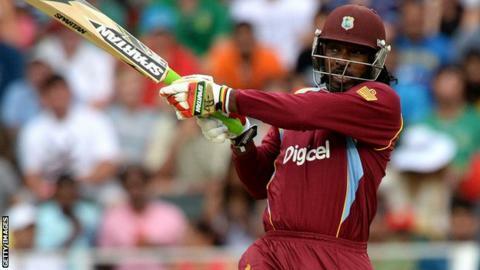 The former West Indies captain added: "Come on guys, it's just ridiculous. Honestly, it choked me up. "I don't know where our cricket is heading with this sort of situation. It's really sad." Trinidadian all-rounders Bravo and Pollard had been told they would be left out of the World Cup squad as the Windies were building a team for the future. "What they're telling us then, is this team selected is not going there to win the World Cup," added Gayle. "Building for the next World Cup [in 2019] is ridiculous." Man of the match Gayle was speaking after he, Bravo and Pollard helped West Indies complete the highest run chase in Twenty20 history in a four-wicket win over South Africa in Johannesburg on Sunday. West Indies open their World Cup campaign against Ireland in Nelson, New Zealand on 16 February. Click here for the full World Cup fixture list.